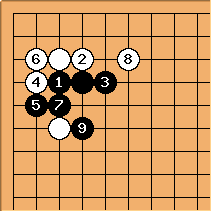 Taw (total beginner): What to do if White invades at 3-3 after Black's tenuki ? 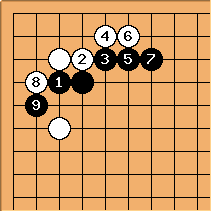 Unlike the unsupported invasion at 3-3, neither of the following seems very good for Black. Of course my intuition may be completely wrong. lavalyn: While I "know" that in variant 2 is considered an overplay in many cases, I've yet to see a good argument for that. 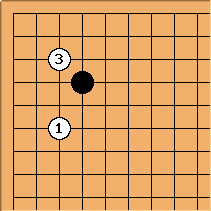 How goes the usual punishment for the hane at the head of two? 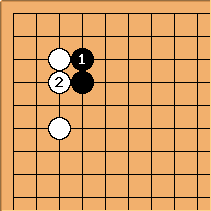 adamzero: Black now either loses the top single stone , giving White a strong position on the fourth line with good influence, or his three stone group, giving White some nice territory and totally blighting Black's initial corner stone with no compensation. 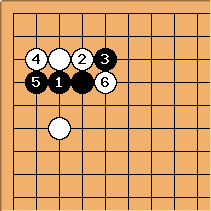 I've found some players making this mistake occasionally all the way up around 2 kyu. It's sort of amazing. Charles Matthews There is something about this at pushing battles in joseki 4. But Variant 2.1 is the common sequence in pro games. Bill: is inconsistent with , which aims at cutting White in two. After , if now then is bad for Black. 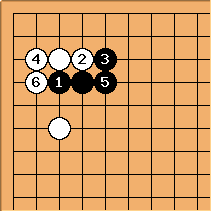 Black has nothing better than to protect with and now connects. unkx80 is essentially a reversion to 4-4 point one-space low pincer invasion, interception#3.